TimeTimer is a timer that visualizes by a red disc how much time is left, for example for a piece of work to be done. Even persons with difficulties in understanding a traditional clock will have no problem to use TimeTimer. 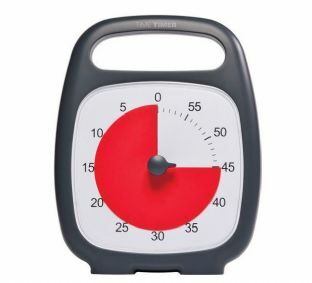 The large TimeTimer is especially designed for classroom and group activties. It can be wall mounted, and its large size and bold dial numerals make it even for visually impaired users easy to read. In addition, this model features an optional audible signal. The new Time Timer PLUS protects the signature red disk under a clear and durable lens. Simple new controls ensure ease of use for all ages. New features represent nearly 20 years of growth and innovation. Did you ever looking for the small TimeTimer in a trendy and colorful version? Have you always desired a plastic cover to protect the red disc of your small TimeTimer? Both wishes are fulfilled with the new TimeTimer MOD! The fabulous innovative cases in vibrant, modern pink, aqua and lime colours can be ordered seperately for your Time Timer MOD. What a great way to bring some fun to daily time management! With the Time Timer CD you have the option to use a visual depiction only, or add sound. Easily change from minutes to seconds or even hours, offers a lock-down feature, alter on-screen size. Mac and Windows compatible. All the benefits of the Time Timer – on your wrist! Increases indepence and mobility for all who benefit from time management. A complete new design, available in youth and adult size. Easy to use.